One day some cruel god decided to swap the personalities of the Norways and Finlands. Denmark was being chased by a butterfly and wanted Norway to protect him when Norway suddenly punched him in the face. He tried to ask Norway why he would do such a thing, but got punched again. Denmark was so horribly confused, and screamed like a girl whenever Norway tried to touch him the next day. Sweden was just minding his own business and watching the news when Finland suddenly got all cuddly and kissy kissy. Sweden was scared for his life but ended up doing things he regret, and which Finland will kill him for if he dares ever mention it again. And somewhere Hetalia Sweden is wondering why Finland is trying to kill him with a kitchen knife. It actually hurt my soul a little bit to draw Norway and Denmark like this. 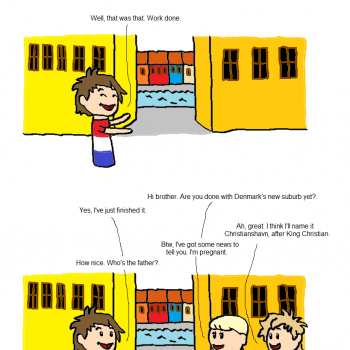 Now I'm thinking about how happy Hetalia Denmark would be though. A Norway that actually is okay with paying attention to him. Like a dream come true. Thought let's be honest. I'd be slightly scared of Hetalia Norway smiling and laughing nonstop with a dead, rotting fish in his mouth or on his head. As a Hetalia and SaTW fan, I must say, the stereotypes used for Hetalia Norway and the ones used for SaTW Norway are so different! 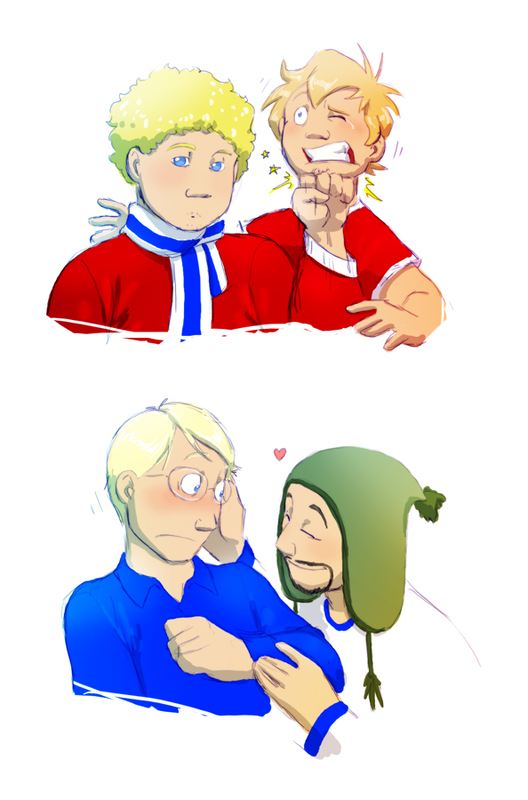 If you draw Hetalia Norway expressing behaviour similar to SaTW Norway, you realize you have just drawn Satan. If you draw SaTW expression behaviour similar to Hetalia Norway, you've once again drawn Satan. Hetalia Denmark and SaTW Denmark are pretty much the same with a huge hight difference and SaTW Denmark being a lot less innocent. Hetalia Finland expresses stereotypes more so coming from Santa Clause (Chubby, jolly, motherly) with other attributes coming from the Finnish Army. SaTW Finland has more of a monotone, vicious personality, something that would never fit well on Himaruya's Finland. SaTW Sweden has a lot more expressions, and is shorter (If not, SaTW Norway is more of a giant then we thought) then Hetalia Sweden. Then of course, Hetalia Iceland is (what I'm assuming) physically and mentally younger then SaTW Iceland. SaTW Iceland has a funner, but more vicious personality when Hetalia Iceland resembles one of those kids in high school who claim they could kill you, but would really run away if you even threatened to slap them. @CanadianLumberjack Agreed, you said it all for me. The only character that stays the same in the two shows : Denmark. Very true. The only difference between the two is Hetalia Denmark is the (second) tallest one and Hetalia Norway's slightly shorter, when in SaTW, Norway's way taller and Denmark's way shorter. NOOOOO! >~< .^. I can't decide if I like it or resent it! I agree! 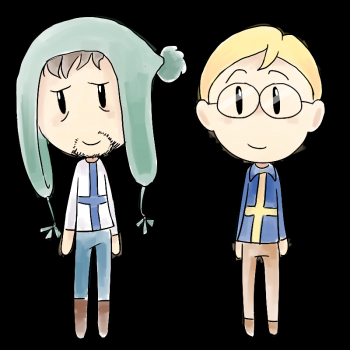 The SaTW characters are so unique despite them being based off of stereotypes, just like the Nordic 5 are from Hetalia. I guess the stereotypes used for each character, both Humon's and Himaruya's, seem to only work with the characters we're used to them being in. @kobirita YES! except you have to remember that the hetalia characters also realize their bodies have been swapped... why did they just go with it? Especially Norge?! Norge and Fin were probably just bored, and wanted to pull a prank by dimensional jumping, and confusing the others.... SO IN THE END, NORGE DID IT! ALL HIS FAULT! @kobirita My mind works in strange ways for sure. But let's think about this. Aph Sealand would be in tears the first time Finland even glanced at him. He is used to a fatherly love from aph Finland and would probably end up with depression due to the switch. Aph Estonia would be worried for his friend, and aph Russia would follow Estonia, however as soon as they got there, Finland would chase after them with a knife. The rest of the aph world would be extremely surprised that aph Russia was scared of Finland. Aph Belarus would be mad at Finland for chasing her brother and they would end up going into a very big knife fight.